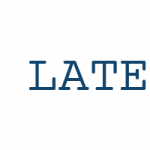 This series takes a look at current trends in screenwriting and screenplay formatting, by examining the 2013 Black List scripts. In Part 1, I investigated the page count stats. 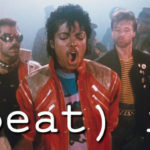 In Part 2, I examined the use of bold and underlined scene headings. 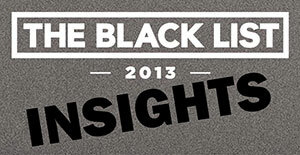 The Black List 2013 – Part 3: One or Two Line Spaces before Master Scene Headings? I was originally going to look at the prevalence of using non-standard fonts and font-sizes on title pages, but I’ll do that next time. Since I looked at the incidence of bold, underlined and bold and underlined scene headings last time, I thought it would be better to look at something somewhat related — the spacing that comes before master scene headings. Why is the discussion somewhat related? Because I found a not-so-surprising correlation between using only one blank line space and using bold scene headings. 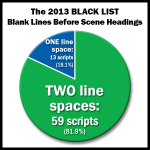 Of the 72 scripts, 59 used two blank lines before master scene headings (81.9%). That means 13 — used one blank line (18.1%). Of the 13 scripts that used one blank line space, a full 8 of them used bold scene headings (61.54%). So why are scripts that use a single line space almost twice as likely to use bold scene headings? It’s simple — the whole point of having two blank line spaces is to break up the pages, inject some white space and make the script feel less dense. If you use a single line space, then adding bold to the scene heading helps to do the same thing. It visually “chunks” up the page and makes it easier for the reader to see when a new scene starts. If you look at the median page count of those 13 scripts that used one blank line and compare it to the median page count of all the scripts in the 2013 Black List — the number is the same: 110 pages. 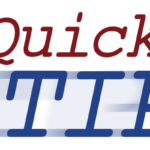 In a typical script if you change from triple-spacing (two blank lines between scenes) to double-spacing (one blank line between scenes) you can actually cut your page count by two or sometimes three pages. I may be wrong, but I suspect that at least a few of the writers opted for double spacing and bold scene headings, versus triple spacing and no bold, to lower their page count. No readers really care if you double or triple-space your scripts (i.e. use one blank line or two before scene headings). They might not even notice. What they do notice is the amount of white space in your scripts. If you’re consistently using 5 to 8 line paragraphs in your scene descriptions, you run the risk of irritating a reader. It won’t matter if you’ve left two blank lines between your scene headings because the script will just feel dense. Try to limit your paragraphs to 3 or 4 lines. 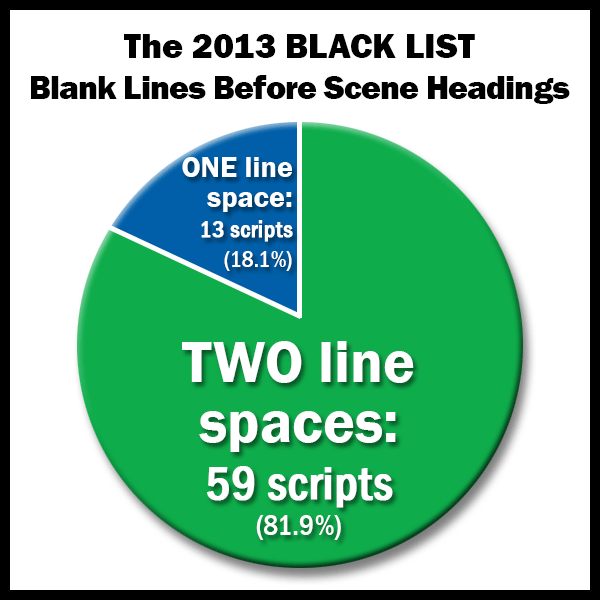 It’s worth pointing out that the script that topped the 2013 Black List — Holland, Michigan by Andrew Sodroski — used the bold scene headings and single blank lines approach. I have no idea as to Andrew’s thought processes, but the script clocked in at 117 pages. And 117 pages has a whole lot nicer ring to it than 120 pages — which it might have been if he had used triple-spacing (two blank lines). Then again, he might have just liked the way it looked.